Current: Interview: Kyle Higgins on the new series C.O.W.L. Interview: Kyle Higgins on the new series C.O.W.L. Kyle Higgins, of Batman and Nightwing fame, joins us to discuss his new ongoing creator-owned series, C.O.W.L. written with Alec Siegel and with art by Ros Reis. 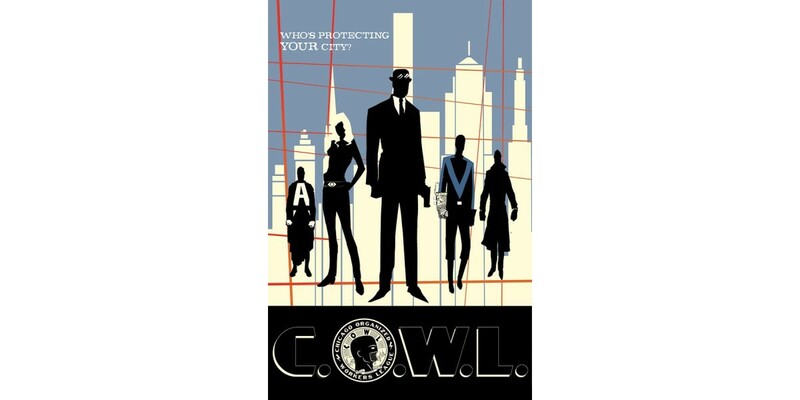 First announced at Image Expo in early January, C.O.W.L.’s 1960s superhero storyline has already garnered quite a buzz among fans of superhero comics and crime-fiction alike. Here we get the scoop on C.O.W.L. and what fans can expect from this twist on the superhero genre coming this May. What makes the characters in C.O.W.L. different from what readers might expect from the average superhero story? Kyle Higgins: Well, for starters, our characters can change. As much as I love writing guys like Batman and Nightwing, there’s a very set standard when it comes to who they are and what they can do… how they’re allowed to react to certain things and what decisions/mistakes they’re allowed to make. We don’t really have those limitations in C.O.W.L., which means being able to explore these heroes as real people, watching them grow and change… for better and for worse. The risk with any new superhero story is creating characters who are just analogues to pre-existing superheroes... albeit with a slight twist. Now, a certain amount of that is going to be inevitable in any story with powers. However, it’s something that Alec and I work very hard to stay away from. We’re really hanging our hat on how character-focused this series is. We’re looking to explore all the different sides of these people, contradictions and all. What inspired you to write about superheroes that had joined a labor union? What made you think of Chicago in the 1960s? Tell us a little bit about C.O.W.L.’s origin story. Higgins: It started during college, when I was developing my senior thesis film. The idea of organized heroes was something that made me laugh until I realized how many interesting moral questions it created. If the heroes worked full-time, they could do more for the city. But in order for that to happen, they needed to get paid. Once money is involved, at what point does a hero stop being a hero? Can the two go hand in hand? From there, the decision to set things in 1960s Chicago came from two things. First, I find stories with fantastic elements (IE: costumes and superpowers) easier to buy into when they’re set in an era that’s not our own. Especially something like organized superheroes, where we want to play it straight… setting it in the past feels very natural. The second thing is that labor unions in the 1960s, particularly in Chicago, were quite interesting. The political machine in the city makes for a pretty great backdrop. Why is C.O.W.L.’s value in question? What are some of the obstacles that the group faces? Higgins: The 1960s are a big time of change. For C.O.W.L., the organization has become something of a bureaucratic machine. They’re bloated and complacent. This is the second generation of heroes now, with the original founders mostly retired. A lot of heroes look at C.O.W.L. as a career path. They’re interested in the money, in being a celebrity. Combine this attitude with a lack of big, explosive villains, and it’s easy to see why many wonder whether Chicago needs C.O.W.L. anymore. Of course, as we get into the series we’ll see how complex things really are. One feeling is that if C.O.W.L. were to go away, the villains would come back and terrorize the city. In that regard, C.O.W.L. is definitely necessary in a “big stick diplomacy” way. C.O.W.L. blends superheroes with historical crime-fiction. What was the creative process like with Alec Siegel and with Rod Reis in visually communicating such a specific time period? Higgins: Initially, it was tricky to figure out how real-world our story was. Alec and I are both big history nuts, which made deviating from “what really happened” to “what could have happened” a bit of a process. Eventually, we decided where our history diverged from real world history. I mean, the second you introduce super powers… there has to be a divergence. Since then, it’s been a total blast developing our version of the 1960s—blending different styles and aesthetics, working with Rod to figure out what he likes (hint: Sci-Fi) in order to create a unique, yet recognizable version of the era. The first issue of C.O.W.L. arrives in stores on 5/28 and will be available for $3.50. It can be pre-ordered using Diamond Code: MAR140477.